Every Frome Festival throws up at least one gem, one unexpected hit. 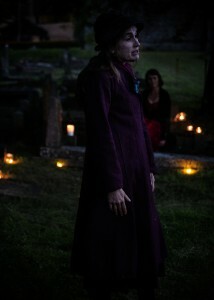 This year it was ‘Midsummer Dusk’, a 45-minute site specific play performed in the Dissenters Cemetery in late evening as darkness fell. It proved such a pull that two planned performances had to be extended to three. And what a setting! 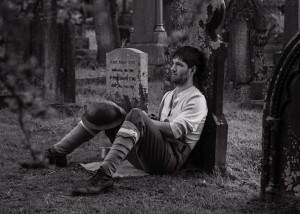 The trees, the dusk views across towards Orchardleigh, the bats (and a few midges too), the candlelight picking out the acting area as the audience cuddled up three to a hay-bale on the grass among the grave-stones. 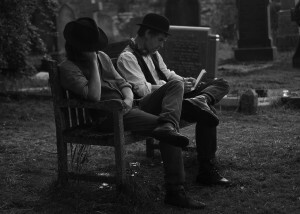 The Frome Dissenters Cemetery was set up in 1851 to provide a final resting place for members of the Baptist and Congregational (independent) chapels which dominated the town’s religious life. One such non-conformist was the writer Katherine Ashworth who wrote gushing articles on the glories of Frome for Country Life. 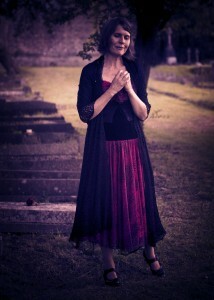 She left a house in Wine Street to the Frome Society for the price of a red rose to be placed on her grave each Midsummer’s Day. The house was to be a Museum for Frome, but proved unsuitable. It was sold, and the money still stands in the accounts of the Frome Society awaiting some future good purpose for the people of Frome. 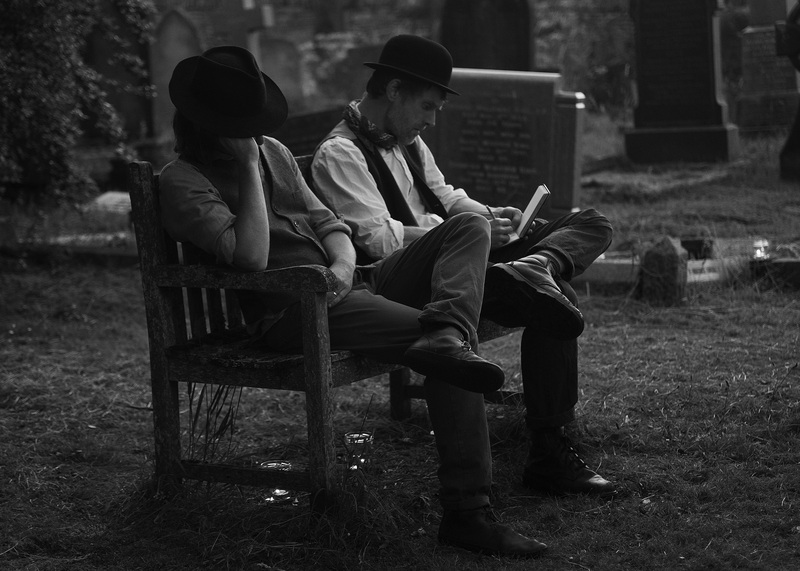 Around this character, writer Crysse Morrison and director Rosie Finnegan have fashioned a play that stitches together just a few of the many stories to be absorbed form reading the grave-stones and a little research in the archives at Frome Museum. There is young Norman Case (Oliver Wright), killed on the Western Front in 1916 (“All the women of England are in mourning for someone”). There is the devoted maid Kitty, naively unaware of the sexual advances of the ‘Young Master’, dead at the age of 24, (“Absent from body, at home with the Lord”). There is Mrs Miller whose sons skipped chapel, and died skating on thin ice on the lake at Orchardleigh. Both these parts are played by Jo Raphael whose effective use of local dialect contrasts nicely with the more educated reflections of Annabel Macfadyen as Mrs Ashworth. Then there is a Victorian minister W.J.Harvey (Oliver Wright again) reflecting on the 200 years that have passed since the notorious Act of Uniformity of 1662 which drove many clergy from their livings, including the vicar of St John’s in Frome. He reflects on the 45 years that were to pass before Frome acquired its first legal independent chapel at Rook Lane in 1707. For him, dissent meant not rebellion, but a right and proper reading of the word of God in the Bible. The emotional heart of this brilliantly crafted play is the counterpoint between the wistful sadness of Mrs Ashworth and the broken-hearted mourning of Mrs Miller. 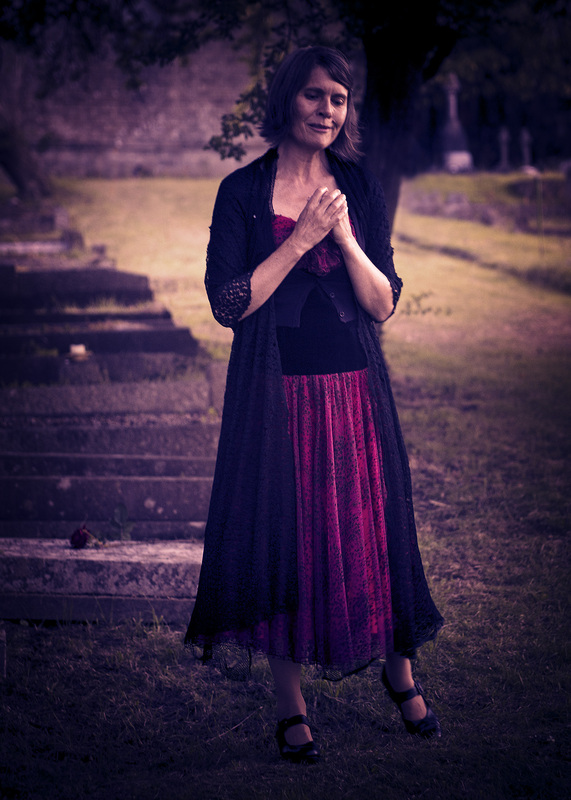 They comes together in the magical darkness at the end of the play as Annabel Macfadyen sings ‘La Vie en Rose’ while Jo Raphael is still calling out for her drowned boys. No-one writing a play set in a cemetery can ignore Hamlet, of course, and Crysse Morrison is no exception. There is a hilarious interlude when Bill and Ted (Paul Ralston and Eddie Young), two local boys for all seasons, have a comic discussion about God, Life, Belief, Dissent and the Meaning of Everything (as boys will) that had the audience shaking with mirth. Like Shakespeare, Morrison has learned to mix comedy and tragedy, just as it forms the two faces of all our lives. Jim Parsons, Secretary to the Cemetery Trustees, commented a little tongue-in-cheek that the cemetery in Vallis Road gets few visitors now, and its residents can feel lonely at times! 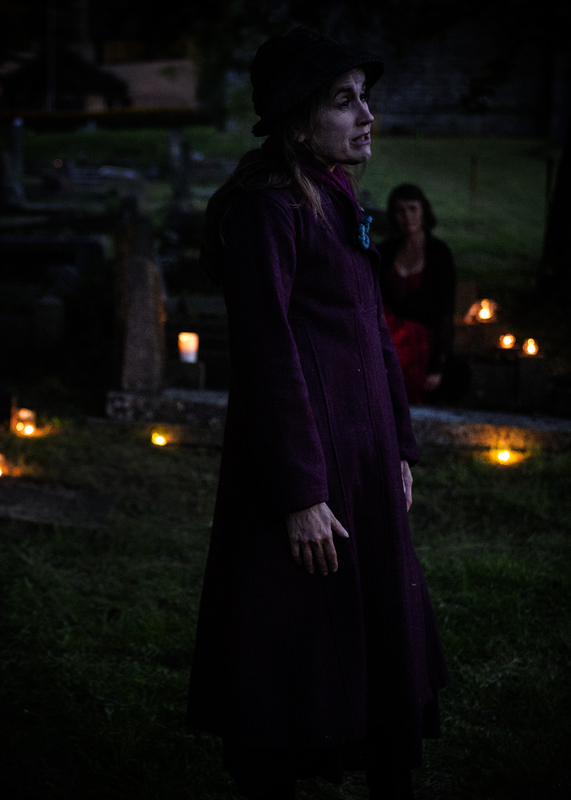 He hopes that these 3 performances will encourage more Frome people to visit the site, and read and reflect on the many stories carved in stone there. Show your creative side. Use your own designs or choose from one of our design templates. Free strategy event for Frome business owners. Get more profit & your team working better.